(Nanowerk News) An extremely small RNA molecule created by a University of Colorado at Boulder team can catalyze a key reaction needed to synthesize proteins, the building blocks of life. The findings could be a substantial step toward understanding "the very origin of Earthly life," the lead researcher contends. The smallest RNA enzyme ever known to perform a cellular chemical reaction is described in a paper published this week in the Proceedings of the National Academy of Sciences. The paper was written by CU graduate student Rebecca Turk, research associate Nataliya Chumachenko and Professor Michael Yarus of the molecular, cellular and developmental biology department. Cellular RNA can have hundreds or thousands of its basic structural units, called nucleotides. Yarus' team focused on a ribozyme -- a form of RNA that can catalyze chemical reactions -- with only five nucleotides. 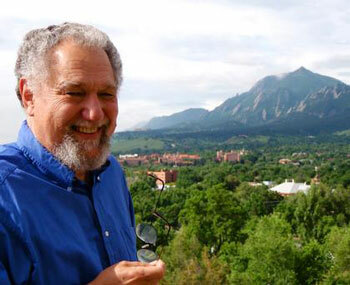 Tom Blumenthal, a professor and chair of the MCDB department, noted that Tom Cech, a Nobel laureate and distinguished professor of chemistry and biochemistry at CU, and Professor Norman Pace of MCDB, independently discovered that RNA can act as an enzyme, carrying out chemical reactions. That "pioneering work" has been carried on further by Yarus, Blumenthal said. Because proteins are complex, one vexing question is where the first proteins came from, Blumenthal said. "It now appears that the first catalytic macromolecules could have been RNA molecules, since they are somewhat simpler, were likely to exist early in the formation of the first life forms, and are capable of catalyzing chemical reactions without proteins being present," he said. "In this paper the Yarus group has made the amazing discovery that even an extremely tiny RNA can by itself catalyze a key reaction that would be needed to synthesize proteins," Blumenthal said. "Nobody expected an RNA molecule this small and simple to be able to do such a complicated thing as that." The finding adds weight to the "RNA World" hypothesis, which proposes that life on Earth evolved from early forms of RNA. "Mike Yarus has been one of the strongest proponents of this idea, and his lab has provided some of the strongest evidence for it over the past two decades," Blumenthal said. Yarus noted that the RNA World hypothesis was complicated by the fact that RNA molecules are hard to make. "This work shows that RNA enzymes could have been far smaller, and therefore far easier to make under primitive conditions, than anyone has expected." If very simple RNA molecules such as the product of the Yarus lab could have accelerated chemical reactions in Earth's primordial stew, the chances are much greater that RNA could direct and accelerate biochemical reactions under primitive conditions. Before the advent of RNA, most biologists believe, there was a simpler world of chemical replicators that could only make more of themselves, given the raw materials of the time, Yarus said. "If there exists that kind of mini-catalyst, a 'sister' to the one we describe, the world of the replicators would also jump a long step closer and we could really feel we were closing in on the first things on Earth that could undergo Darwinian evolution," Yarus said. "In other words, we may have taken a substantial step toward the very origin of Earthly life," he said. "However, keep well in mind that the tiny replicator has not been found, and that its existence will be decided by experiments not yet done, perhaps not yet imagined." "Dr. Yarus has brought an innovative approach to bear on the key question of how complex processes originated," said Michael Bender, a biologist who oversees protein synthesis grants at the National Institutes of Health's National Institute of General Medical Sciences. "By showing that a tiny segment of RNA can perform a key step of protein synthesis, this study has provided evidence that fundamental, protein-mediated cellular processes may have arisen from RNA-based mechanisms."